TekDevices has released a new version of the Mobile GDO app for remotely controlling and monitoring garage doors with an iPhone anywhere in the world. The app now includes voice, audible button alerts and additional user customization features. Users now receive verbal confirmation of whether their garage door is open or closed and if the garage door opener has been activated without looking at their iPhone. In addition, audible button alerts provide reassurance that the user has initiated a command. Included in the app are the options to choose between 3 different voices and 3 different button sounds. This iOS app works in conjunction with a Mobile GDO controller. 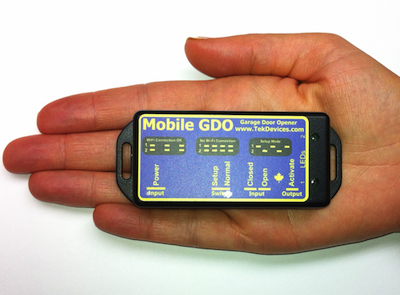 The Mobile GDO controller is a small device that connects to existing garage door openers and turns an iOS device into a remote control for opening, closing, and monitoring a garage door. The Mobile GDO controller is available for purchase at http://www.TekDevices.com. Not only is controlling a garage door with an iPhone incredibly cool, it has many benefits to a homeowner. Often homeowners drive away from their garage and worry about whether they had closed it and if their valuables were safe. The Mobile GDO controller, along with its free App, will give homeowners the power to check if their garage door is open or closed, and to open or close it from anywhere in the world using an internet connection. Another advantage to the Mobile GDO controller is that it is a retro fit and works on any garage door opener that operates on a push button switch. There are no monthly fees required. TekDevices is an iOS hardware and app design and development division of Soeltech Automation Inc. whose vision is to develop hardware and software to make it easier for the consumer to efficiently carry out their daily activities. TekDevices’ first product is the Mobile GDO which addresses the day to day concern of homeowners knowing whether or not their garage door is open or closed.